The stage is being set for a coordinated attack on the patent system under the guise of making international health care more affordable. A newly released United Nations report encourages developing countries to use compulsory licenses to seize drugs, mostly developed in the U.S. The report was quickly followed by two high profile efforts pressuring our government to misinterpret the Bayh-Dole Act, designed to promote public and private sector R&D partnerships, with claims it allows agencies to move against high priced drugs both here and abroad. While the UN report was immediately opposed by the State Department and the National Institutes of Health recently rebuked attempts to undermine Bayh-Dole, the critics are anticipating more compliant political appointees in the next Administration willing to do their bidding. But even as the storm clouds gather, we can take heart from what recently happened when two prominent opponents of the life science industry had to present their arguments in a fair and open debate. With our formidable lead in drug development, it’s readily apparent why the U.S. life science industry is such a target. 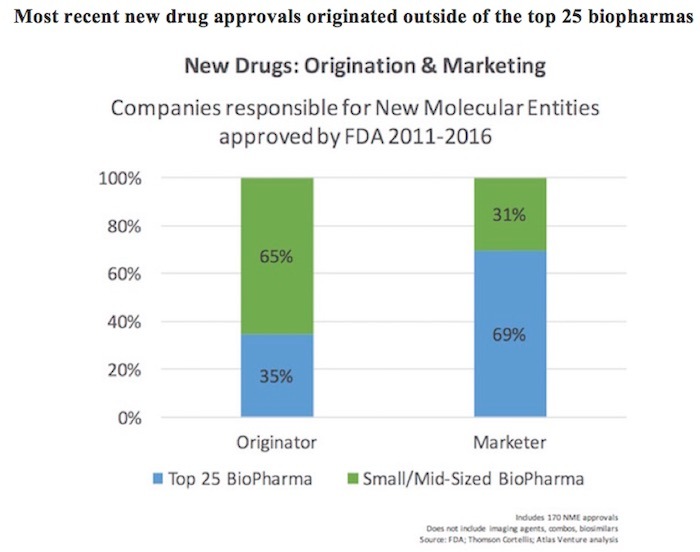 This reflects the increasing collaboration and convergence in the biopharma ecosystem, and affirms the trend over the past decade where larger companies are increasingly sourcing innovation externally. As was discussed on this blog previously, 75% of the most “transformational” pipeline drugs in big pharma 2014 were externally sourced via business development (mergers with other larger players, acquisitions of small companies, or licensing deals). Successful R&D becomes as much about good science as it is about good business development. The U.S. leads the world in transforming good science, primarily performed in our universities with government support, into licensed inventions and new companies that drive innovation. We create two new companies around academic inventions every day of the year. The critical role such companies play in our drug development system is clearly illustrated above. The successful integration of public research institutions into the economy is based on the Bayh-Dole Act, which inserted the incentives of patent ownership into the government R&D system. Not a single new drug had been developed from NIH funded research under the patent destroying policies preceding Bayh-Dole. No one is going to spend billions of dollars and more than a decade of effort turning early stage inventions into new drugs or fund a life science startup company without strong patent protection. Yet the patent system and Bayh-Dole are precisely what the critics seek to undermine. If they succeed we can expect the number of drugs developed here to decline to the levels of the rest of the world. What that would mean for protecting human health is not pleasant to imagine. But that doesn’t faze the critics. Last month the UN High Level Panel on Access to Medicines issued its long awaited report blaming patents for lack of access to health care in developing nations. It encouraged poor countries to aggressively use compulsory licenses to seize drugs they deem too expensive. Even though the Department of State promptly blasted the study for being biased, it will be used as a justification for governments to act. NIH appropriately ruled in June, as it had done many times in the past, that Bayh-Dole does not empower agencies to impose price controls on products developed from federally funded research. Further, NIH is not funding “drug development,” but early stage research with the considerable risks and expenses of commercialization falling on private industry. But the claim the government is developing high priced drugs helps incite public emotion. Then on October 17, “over 50 patient, senior citizen, global health, development, social justice, and faith groups” urged the Department of Health and Human Services and the State Department to “use its rights in a federally funded patented invention, and accept the request by a Canadian generic manufacturer” to manufacture a generic version of Xtandi, a prostate cancer drug invented under a federal grant, for use in low income countries under the authorities of Bayh-Dole. The law allows funding agencies to use resulting inventions royalty free to meet their mission needs, not to oversee international product pricing, but the critics hope to find pliable officials in the next Administration willing to misuse the law. One thing all these efforts have in common is trying to sell undermining the patent system and Bayh-Dole as ways to alleviate the suffering of those facing the ravages of disease. But what would happen if the critics had to make their arguments against experts who really know how the drug development system works? Recently we got an answer. IQ2US ( ‘intelligence squared US’) is a “nonpartisan, nonprofit organization working to restore civility, reasoned analysis, and constructive public discourse … through a series of debates on important public policy questions.” The organization ensures a rational discussion through debate rules overseen by an impartial moderator. Unlike the shouting matches on cable news, the speakers have to rely on logic and facts to make their points and are not allowed to talk over each other. Each side must succinctly present their argument and has an opportunity to challenge their opponents. They also must take questions from the attendees. The audience votes on the issue at onset of the program and again at the conclusion to see if opinions have shifted. The most recent debate was Blame Big Pharma for Out of Control Health Care Costs and it included some real heavy weights. It is well worth watching. Arguing for the proposition is Ezekiel Emanuel, one of the architects of the Affordable Care Act (i.e. Obamacare) and the brother of Rahm Emanuel, former Chief of Staff to President Obama and currently Mayor of Chicago. He is joined by Neera Tanden, an advisor on health reform in the Obama and Clinton Administrations, who leads the Center for American Progress. The Center was founded by John Podesta, formerly President Clinton’s Chief of Staff and now Chairman of Hillary Clinton’s presidential campaign. Tanden features prominently in the recent WikiLeaks emails. Opposing the motion are Lori Reilly, Executive VP for Policy, Research and Membership of PhRMA and Paul Howard, Director of Health Policy of the Manhattan Institute. While patents and innovation are not the immediate topic at hand, Emanual and Tanden throw many of the claims driving the attacks on patents and Bayh-Dole into the mix in their opening statements. They blame patents and FDA approvals for creating drug monopolies allowing the public to be gouged. They claim citizens are “paying twice” for medicines since taxpayers underwrite NIH research which is licensed to industry and turned into new drugs. They argue that company profits could be limited by government without impacting innovation. I won’t attempt to summarize the debate in the space remaining. Suffice it to say that the audience initially votes in favor of the proposition. However, after both sides are heard, blaming the drug companies is voted down. In the current environment, that’s like being found “not guilty” at the Salem Witch trials. Who knows, maybe having rational discussions of the issues will even extend to drug development. If so, the United States will continue leading the way confronting the diseases which plauge humanity. If not, try not to get sick with anything lacking an effective treatment. You might have to hope the Chinese come up with the cure. What do you think they’ll say when the UN tells them how to price it? We might not need a translator to understand that reply.